Are you looking for ways to enhance the beauty and comfort of your garden? If yes, you should consider installing a sunesta screen. Sunesta screens are the perfect garden screens for any home or business environment. How do garden screens benefit your home garden or commercial garden atmosphere? Sunesta screens are garden screens that can truly be utilized as essential items in home gardens and commercial gardens. Why? For one, sunesta screens can expand and improve your outdoor living space. Sunesta screens can make your home garden or commercial garden more private and reclusive. The sunesta screens will help you enjoy the colors, smells, and textures of your garden without you being pestered from insects such a mosquitoes. Sunesta screens are the privacy screens any homeowner or business owner can appreciate. Sunesta screens are elegant, stylish garden screens and you can have them customized with any logos or patterns you desire. 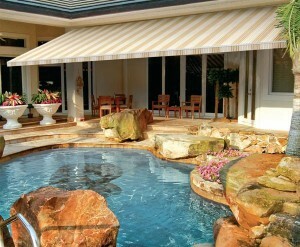 To have sunesta screens installed in your garden today, hire Carroll Awning Company. Take a look at our sunesta screens. You won’t be disappointed with these garden screens.